To send flowers or a remembrance gift to the family of Donald G. "Buck" Douglas, please visit our Tribute Store. A visitation will also be held Monday, February 11, 2019 from 10:00 A.M. until 10:45 A.M. at First Baptist Church in Darlington. 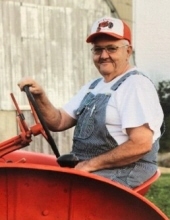 Memorials may be written out to "the family of Donald Douglas"
"Email Address" would like to share the life celebration of Donald G. "Buck" Douglas. Click on the "link" to go to share a favorite memory or leave a condolence message for the family.